According to Wikipedia, "This Too Shall Pass" is an expression taken from a Jewish folktale about King Solomon. To this guy, apparently, it means a lot, as he decided to tattoo the expression in Hebrew, on his ribs. I find it a bit ironic that a permanent tattoo says "This Too Shall Pass". Had it been correct, I might have found it a bit clever too. In any case, while the spelling on this Hebrew tattoo is fine, there is one big flaw - it lacks spacing between the words of the expression. Yes, boys and girls. It might come as a shock, but the Hebrew language utilizes the space. Just like English. Don't forget to use it! Well, ancient Tanakh-ic scrolls did lack spaces, if I recall correctly. So let's dan l'khaf zekhut. Maybe it's referring to a kidney stone? Tha ancient Tanakh had spaces- what it lacked was vowels and chapter breaks. Boook breaks in the Torah are indicated by larger than normal paragraph breaks. In the rest of the Tanakh each book starts at the head of a page. It's actually kind of a clever tattoo if it is correct - the notion that a tattoo is no more permanent than you are, that is. I want this as my first, and only, tattoo. 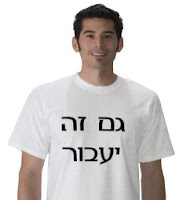 Should i get it in Hebrew, Latin or English? Thoughts please? It's a tattoo. You don't need to have spaces. Having no spaces can be an aesthetic. Why sometimes is it written one way then other times written the oposite way? does it matter which way its written or does it mean the same reguardless? It should always be written from right-to-left, otherwise it's backwards. JV Douglas, yes they are forbidden. However, the Torah is essentially the same thing as the Old Testament. So is the T-shirt the right way or the text?